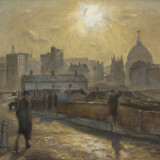 The fourth edition of The Nobile Folios explores St Paul's from Moor Lane, painted by Cyril Mann in 1948. London in the late '40s was beleaguered by the devastation of war. Mann cast his intense gaze on this scarred cityscape, and saw it for what it was. But his was no regular gaze: he saw the vitality and energy beneath this desperation which was symbolized by blinding light of the glowing ochre sun. This folio unearths Mann's vision by setting free the miraculous details that form this astounding canvas and by allowing two works to inform our reading of it. The first, a thoughtful essay by art critic Mark Hudson that contextualizes the painting and the artist; the other, a moving story by novelist Veronica Cecil about a cantankerous painter tapping into his creative energies.